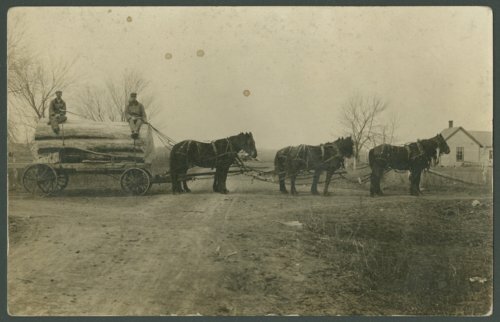 This photo postcard shows a large log being pulled by a team of horses in Pottawatomie County, Kansas. The handwritten message on the back indicates that the photograph was taken at "Chick's Corner." The postcard was mailed to Wiley Taylor, of Louisville, Kansas, who at the time was a pitcher for the St. Louis Browns baseball team. Taylor pitched in 27 major league games, most of them with the Browns, and also played for several minor league teams. Wiley Taylor was a life-long resident of Pottawatomie County, where he farmed and served four terms as the county sheriff (1925-28 and 1945-48).